Come and relax at campsite Campilô. Our pitches and rentals will grant you space, freedom and silence for the most relaxing holidays. Forfait 2 personnes, 1 tente, caravane ou camping-car. Attention! Afin de pouvoir bénéficier des tarifs indiqués pour les billets du Puy du Fou, il faut effectuer votre réservation au minimum 3 jours avant la date de la visite. Forfait Nature avec électricité 16A Attention! Afin de pouvoir bénéficier des tarifs indiqués pour les billets du Puy du Fou, il faut effectuer votre réservation au minimum 3 jours avant la date de la visite. Attention! Afin de pouvoir bénéficier des tarifs indiqués pour les billets du Puy du Fou, il faut effectuer votre réservation au minimum 3 jours avant la date de la visite. Forfait Confort avec vue sur plan d'eau ou grand emplacement Attention! Afin de pouvoir bénéficier des tarifs indiqués pour les billets du Puy du Fou, il faut effectuer votre réservation au minimum 3 jours avant la date de la visite. No place to run the dogs off lead. There were several marked walks in the immediate vicinity but there was no knowledge or explanatory leaflets about them. Indeed, they appeared unknown to the staff; The most significant weakness was the quality of wifi - a fussy and fragile system that failed totally on two occasions for a significant period of time. No camping wifi is ever perfect but this was the weakest of the three sites that we stayed in this summer. The general ambiance - family feel. Excellent washing and showering facilities, always immaculate. The two lakes provided a restful setting and ideal for short walks. The rule that cars were parked separately. A little disappointed the pool opening hours weren't longer especially in the early evening as it was very warm. Not sure about not being able to park on our pitch but could see may help the general atmosphere of calm. Loved the calm atmosphere of the pitch. The flowers and planting were most attractive. Washing facilities were some of the cleanest ever. Lovely friendly staff. We were just surprised how many pitches were vacant even when the tour de France was nearby. Convenient to cycle to la Roche Sur yon. Great location in lovely countryside. Excellent shower facilities. The pitches got more sun than i expected them to on reading the blurb. If you look at the site on google earth, it is a mass of trees. So expected more shade than we were looking for, but got a sunny pitch. Of which there are a good number. The reception was very helpful. The site is quite level in the main, and has a good number of leisure pursuits available. The shower block was very clean. The phone signal is good, and the free wifi excellent. And the town is handy for supermarkets/fuel and shopping in general. A minor point, and I wouldn't let it put you off; Some of the pitches are a bit uneven. If I were Natalie I'd take one or two out of service each year and flatten/reseed them. Natalie helped us find just the right pitch so we could fit two large tents and a 4m cooking dome between them. Ideal for a longer stay with two families. The staff are always friendly and helpful, the place is beautifully clean and everything works, or is fixed immediately. I'm not an angler, but the lakes are lovely to walk round, and there's plenty of wildlife. Having cars parked away from the tents sounds wrong, but it really helps make the place quiet and relaxing. I'm not sure how much water is saved by having no plugs in the washing up sinks; you end up washing under a running tap which seems wasteful. Bring a plug! Bring Speedo type swimming trunks as "boxer shorts"style swimming things aren't allowed in the pool. Reception sell the right sort at very reasonable price though. Well spread out; the pitches are spacious so you're not squashed up against the neighbours. We particularly liked not having cars parked in among the tents. Once you've set up, or dropped off the shopping or passengers you put the car in the nearby carpark. 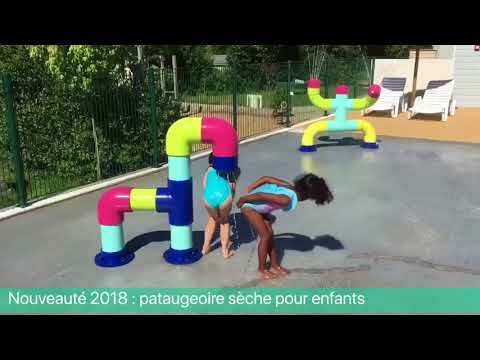 Beau camping bien agencé à dimension humaine, avec de l'espace, belle aire de jeux, espace aquatique sympathique y compris pour les enfants. Des gérants bien aimables et très arrangeants. Je me suis sentie bien à l'aise dans ce mobilhome bien agencé (petit cagibi...) avec terrasse semi couverte bien agréable que ce soit en demi-saison ou saison plus chaude. Ne pas pouvoir profiter de la piscine le jour de mon départ après 12h. Je trouve cela vraiment regrettable de refuser a des clients l accès à la piscine et au camping le jour du départ sous prétexte de ne plus être assuré  et de laisser la place aux autres campeurs entrant surtout quand le camping est loin d être plein. Un peu déçu surtout que l on a au final pas pu profiter de cet espace. Manque du matériel de cuisine (pas de casserole) Nous n avons pas pu faire à manger le soir de notre arrivée. Hébergement très propre et parfaitement adapté. Jolie vue sur le lac.